Fast data applications are growing rapidly – driven by the adoption of IoT, M2M and SaaS platforms. While there’s general recognition that fast streaming data applications can produce significant yet fundamentally different values than Big Data applications, it’s not yet clear what technologies and approaches should be used to derive the value from these fast data streams. Building applications on real-time streaming data has unique requirements. Legacy databases get overwhelmed. A common solution is stitching together a collection of open source projects; however this has a steep learning curve, adds complexity and limits performance and latency. So how do you combine real-time analytics with real-time decisions in an architecture that's reliable, scalable and simple? The answer is a scale out, in-memory database, that’s fast enough (< 1 millisecond) to support per-event transactions. In addition, a platform that supports streaming aggregation combined with per-event ACID processing and SQL, simplifies development and enhances performance and capability. 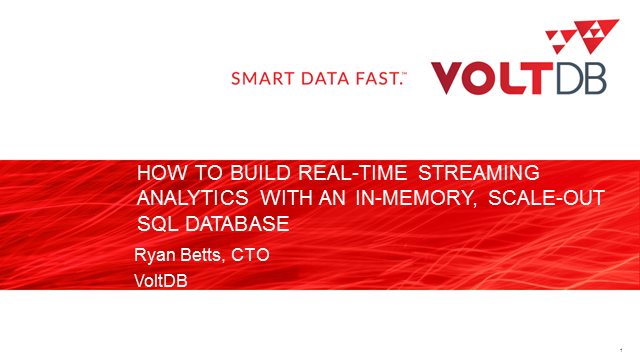 VoltDB uses materialized views to provide real-time aggregation and summary and support combining real-time analytics with per-event decisions. The basis is SQL, which is used to query and re-aggregate views; and up-to-date views can be queried inside of transactions for per-event, real-time transactions.